Larry Downes and Paul F. Nunes:"Big Bang Disruption Strategy in the age of devastating innovation", Portfolio, 2014. Because the topics related method of research and development are within the range concerned of this column, this book was picked up. The "big bang disruption" in this book is a somewhat shocking title, although the title of Japanese translation version is "Big Bang Innovation". I will introduce this book in my own way of interpretation with adding information around, although this book is included to exceed my understanding. Misreading should be avoided. But please forgive me if there is a misunderstanding. The most of this review are based on Japanese translation version of this book. 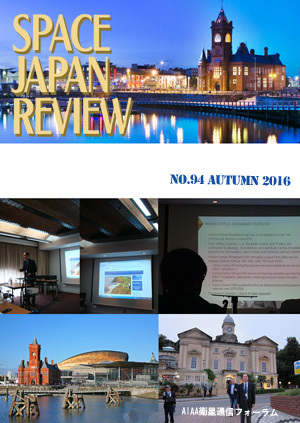 "Bewildered by making colonies in space"
"Development of Domestic Communication/Broadcasting Satellite Equipment 2-1"
The 8th EAI International Conference on Wireless and Satellite Systems (WiSAT2916), which was held in Hotel Novotel Cardiff Centre, Cardiff, UK, 19-20 September 2016, is reported. Chihiro Hayashi, JEPICO "About 40 minutes on foot (in the case of the 2011 off the Pacific coast of Tohoku Earthquake) I was able to reach home, but my mother has gone away from home and can not connect at all with a cell phone. Ultimately, I was able to connect bus and transfer my mother safely, but in such a life that it is commonplace to keep in touch with a mobile phone, such an emergency has brought about great anxiety and inconvenience. "JEPICO's Chihiro Hayashi wrote about encounter with satellite communication and her current work.